There’s no easier way to get everyday savings and exclusive deals than with your Perks Card . 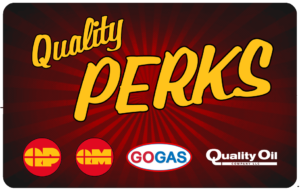 Visit any Quality Plus, Quality Mart, or GOGAS location to pick up a card today, then register your card at perks.QOCNC.com. 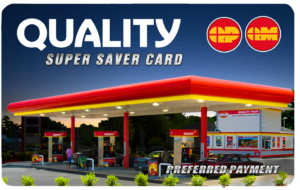 The Quality Super Saver Card is a secure payment card with instant discounts at the pump. You can now link your checking account and your selected PIN with your Super Saver Card, so you can pay for gas and merchandise at participating locations. It’s safer and more secure than a credit card and works like your bank debit card. It’s the convenient way to pay and instantly SAVE on all your fuel purchases. * There is no debit hold on your account with this card. Visit www.QualitySuperSaver.com for more information and to enroll! Get instant savings at the pump with the Value Card! 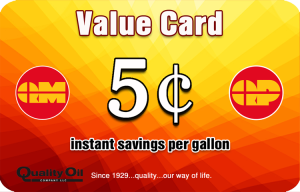 The Value Card is a reloadable cash card that instantly applies a 5¢ discount per gallon at the pump. Available in denominations of $25, $50, $100. 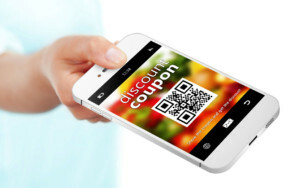 Visit any Quality Plus, Quality Mart, or GOGAS location to purchase Value Cards. Save On Your Next Purchase At Our Drive Thru Window!